What do I put in the bins? 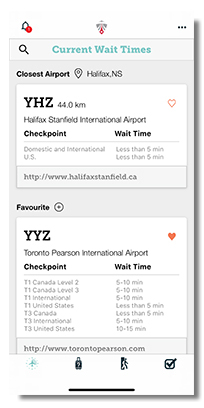 Check the wait times at security screening checkpoints in major Canadian airports. Search the “What Can I Bring?” list to find out if an item is allowed in carry-on baggage or in checked baggage. Find advice for families, passengers with special needs and seniors to help them get through airport security screening quickly and easily. Create a travel checklist to help pack a carry-on bag or a checked bag. It includes security restrictions on various items (e.g. liquids, food, personal items, sporting equipment, tools). Provide feedback about your experience at security screening. This free app is available for Apple and Android devices. Apple, iPhone, iPod touch and iPad are trademarks of Apple Inc.., registered in the U.S. and other countries. App Store is a service mark of Apple Inc.